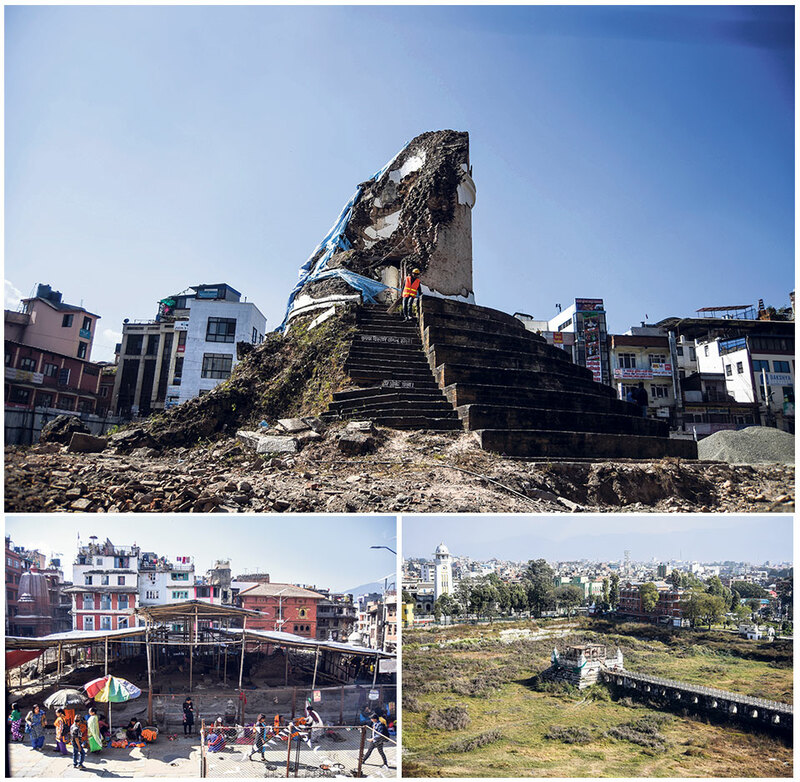 KATHMANDU, Oct 31: More than three years since the monster quake of 2015 shook the entire nation to its core, three iconic heritage sites in Kathmandu are still awaiting reconstruction. Rani Pokhari, Dharahara and Kasthamandap have all been hit by the lack of a conducive environment for reconstruction. Tall weeds now cover Rani Pokhari, the 17th century 'queen's pond' . After multiple rounds of talks between various ministries concerned, the National Reconstruction Authority (NRA), Kathmandu Metropolitan City (KMC) and the Nepali Army (NA), a tentative decision was reached in July to hand over the reconstruction work to NA. But before the decision was even made public, it sparked controversy over the ethics of entrusting the work to a security agency. As a result, the reconstruction, which was actually making some progress, had to grind to a halt. That was over four months ago. These days two bulldozers can be seen lying idle at the site. There are no workers around. The Matrikeshwar Mahadev temple at the center of the pond is also far from complete . The walkway leading to the temple is also in ruins. In addition, the guard assigned to the pond works as a ticket collector at nearby Ratna Park. That leaves the historic pond unguarded all day long. KMC is now opting to invite private companies for the reconstruction of the heritage site. According to spokesperson of KMC Gyanendra Karki, two construction companies had made tender bids for the work but they were dismissed as they didn't meet the requirements set by the metropolis. “We will now reopen the bids for 15 days,” he said. The reconstruction of another iconic heritage feature, Dharahara tower, was started after Dashain . But the pace of the work has failed to pick up. Previously, Nepal Telecom had pledged to rebuild the nine-story structure and had even collected a huge amount of Rs 1.59 billion for the purpose. A public fund set up by the government collected another Rs 2.07 million. But the telecom company withdrew from the project in September 2017. And after a year of dillydallying, Raman-GIETC JV won a bid in September to construct a new 22-story tower at the site, at a cost of Rs 3.45 billion They are supposed to complete the project in two years. As of now, the construction company has only been able to pile up aggregates at the site. According to project manager Shyam Chandra Shrestha, the construction will start immediately after the utilities straddling the area are all cleared away. He added that the number of workers will also be increased to 400 very soon . Kasthamandap, the seventh-century pagoda-shaped public shelter said to be built originally from the timbers of a single tree, is in a similar state of limbo. Only a couple of workers tend to the reconstruction work there on a daily basis. On October 13, KMC Mayor Bidhya Sundar Shakya had handed a cheque of Rs 50 million to the Kasthamandap Reconstruction Committee (KRC). Previously, KRC had stopped the reconstruction work, citing the 'monsoon season' and 'design flaws' . The monsoon has ended but the work has not geared up. The locals have grown angry over the lack of progress . “It is very sad to see that such an iconic heritage site has remained unreconstructed for so long,” said Sarita Shrestha, who owns a retail shop next door. However, Chief Executive Officer of NRA Sushil Gyewali said the reconstruction work at Kasthamandap is not visible now as they are currently focusing on managing the required timber . “We need long-sized, high quality timber for Kasthamandap, which is very difficult to find,” he said. Gyewali said they have finally found timber in Mahottari and the construction work will start soon enough. Gyewali also claimed that reconstruction at Rani Pokhari was delayed by disputes over how it should be built. “Activists wanted it to be built preserving its originality . We have pledged to meet their demand,” he said.